This document contains redacted course notes of the first part of the course Economics of Money and Banking by Professor Perry G. Mehrling of Columbia University in the United States that is available on Coursera.org. This course explains the basics behind money and banking that are essential in understanding the financial system. According to Professor Mehrling, the financial system is about balancing flexibility and discipline. Professor Mehrling builds on his own background in the history of monetary economics and financial economics. He sees himself in the American tradition of monetary thought that is based on the tradition of British central banking thought. Each generation had to rethink the underlying issues for themselves in order to make sense of the conditions of their own time. The current challenge is to work out the implications of financial globalisation for money, banking and central banking. 6.3. What are Fed Funds? 12.4. Anatomy of a "normal crisis"
With regard to money, economic theory may be less useful than the testimony of bankers, whose business requires them to work out the implications of a changing world for their own practise. They have always been practitioners who responded to an inner urge to write down what they knew in the form of a manual. Today these people can be found at central banks, the BIS and IMF and inside the global banking system that comprises the infrastructure of financial globalisation. Their contribution should be taken seriously, but always with an idea to extract useful information that can be translated into economics. To understand the course, some knowledge of macro and micro economics is required. Macro economic theory includes the IS/LM diagram , the macro theory about nominal interest rates, the Fed, the Taylor Rule  and the dynamic stochastic general equilibrium . Micro economic theory includes Fisher diagram, the micro theory about real interest rates and the slope of budget line. It is possible to teach money and banking as applied macro economics or applied micro economics. Micro economics sees banks as firms that perform intermediation because of asymmetric information. 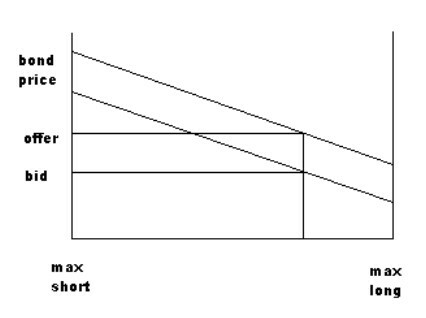 Macro economics analyses the foundations of the LM curve as well as money demand and supply. Understanding the payments system is the best starting place for understanding liquidity. An understanding of liquid assets makes it possible to consider liquid markets. Thus clearing and market making are the two central functions in this respect. - price level for commodities. The world has changed and even the best textbooks lag behind. Existing theories have been developed to explain a different world, such as post-war (government debt) and post-depression (government guarantees and regulation). This led to emphasis on intermediation and monetary policy. Today the world has changed. Private financial markets and globalisation are the key elements of the current time. Practical central bankers know this better than academic economists and traders in the money markets know this even better. In terms of globalisation, trade and integration, the current world is more similar to the pre-WWI world than the post-WWII world. At that time the pound sterling was king and the Bank of England operated as central bank for the entire world. History thus gives more perspective on the current situation. In terms of finance, the current world is in many ways new. There are new financial instruments and a much more wide usage of existing instruments, electronics and telecommunications, as well as new theories. In this situation gold is the ultimate money because it is the ultimate international means of payment. National currencies are a form of credit because they are promises to pay gold. National currencies may be backed by gold, in the sense that the issuer of currency holds some gold on hand, but that does not mean that these currencies represent gold or are at the same hierarchical level as gold. When a currency is backed by gold reserves, it is still a promise to pay, just a more credible promise to pay because the presence of reserves makes it more likely that the issuer of currency can fulfil the promise. Further down the hierarchy, bank deposits are promises to pay currency on demand. There are two steps of promises to pay the ultimate money. Securities are promises to pay currency over some time horizon in the future, so they are even more attenuated promises to pay. The credibility of these promises is an issue here, just as in the case of national currencies. The reserves of the various instruments themselves and the hierarchy above the instruments can help to enhance their credibility. For ordinary people, bank deposits are a means of settlement. Hence, we are inclined to view deposits (and everything above them) as money, and securities as credit. This is more or less what most economic textbooks mean when they speak of the money supply, although there is some ambiguity which is reflected in the various definitions of money such as M1, M2 and M3. For banks, national currencies are money. For a country national currency is of limited value. Other countries want their own currency, or an international means of settlement, which means gold or perhaps Special Drawing Rights at the IMF. The US is an exception because of the international reserve status of the US dollar. In the real world there are more layers and finer gradations in the hierarchy. 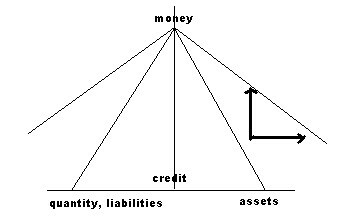 In this simplified hierarchy there are important entries missing, such as government debt as the most important asset of the central bank, loans as an asset of the banking system, and securities as an asset of the private sector. All instruments except gold appear as both assets and liabilities and are forms of credit. 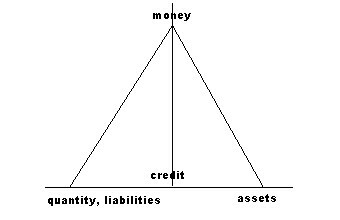 If all three balance sheets were consolidated, in order to treat the economy as a single aggregate entity, all forms of credit would appear as both assets and liabilities, and hence cancel. Only gold would remain because only gold is an asset that is no one's liability. The difference between gold and other forms of money is the difference between outside money and inside money. This analytical distinction first proposed by Gurley and Shaw . They treated currency as outside money and deposits as inside money because they aggregated only over the private economy. The course Economics of Money and Banking considers the entire economy, so all financial assets will be inside, including currency. From the point of view of the financial system as a whole, every liability is someone else's asset. These credit forms cancel out if they are consolidated, but such consolidation is not useful for analysis. Macroeconomic variables like interest rates and GDP, are affected not by the outstanding gross quantity of inside credit, and also by who is issuing it, who is holding it, and where that credit lies in the larger money and credit hierarchy. Standard macro models simplify by focusing entirely on some measure of the outstanding quantity of money, which usually is treated as an outside asset. At almost any time scale the financial system is in motion. There is a daily clearing and settlement, a business cycle and a longer term secular trend. At every time scale, there is an expansion and contraction of the hierarchy. As it expands, the hierarchy flattens and the qualitative difference between credit and money becomes attenuated, but later the system contracts and the hierarchy reasserts itself. At the business cycle frequency, the phenomena surrounding this contraction and reassertion are called irrational exuberance in the expansion phase and financial crisis in the contraction phase. This fluctuation has two causes. First, there is the expansion and contraction of the quantity of credit, which takes place at all levels of the system. Second, and more subtle, is the fluctuation of the moneyness of any given type of credit. In this respect, the quality of credit tends to increase during an expansion, and to decrease during a contraction. To some extent this qualitative fluctuation can be observed as a fluctuation in the availability of credit to marginal borrowers. More generally there are fluctuating credit spreads between the rates charged to qualitatively different borrowers. Whatever the underlying cause of fluctuation, it is a swing from scarcity to elasticity and back again. At all times the monetary system can be characterised by the balance between these two dimensions. The history of monetary theory is to a large extent comprised of a dialogue between two points of view, often distinguished as the Currency School versus the Banking School, which emphasise respectively the importance of scarcity and the importance of elasticity. The currency principle stresses the scarcity of (ultimate) money. The banking principle stresses the elasticity of (derivative) credit. The scarcity comes from the fact that agents at any particular level in the hierarchy cannot increase the quantity of the forms of money at a higher level. Governments cannot increase the quantity of gold and banks cannot increase the quantity of government currency. The availability of money serves as a constraint that holds the system back in its attempts to expand. The elasticity comes from the fact that agents at any particular level in the hierarchy can increase the quantity of forms of credit at their own level and possibly also below them. If two individuals want to make a trade and one of them is willing to accept an IOU from the other, they can trade. What makes the trade possible is an expansion of credit. This natural elasticity applies to banks as well. By trading among themselves, banks can and do break loose of the constraint of central bank reserves. There is also a hierarchy of market makers to go along with the hierarchy of instruments. For each market maker, there is an associated price of money. The prices in the simple hierarchy are three: the exchange rate (the price of currency in terms of gold), par (the price of deposits in terms of currency), and the rate of interest (the price of securities in terms of deposits or currency, assuming par). These prices are the quantitative link between layers of qualitatively differentiated assets. At any moment in time, markets makers are straddling two layers of the system, with one leg in one layer and the other in another. The two legs are the two sides of the market maker's balance sheet. If the market makers do their job well, there will be continuous markets at the various prices of money and the qualitatively differentiated hierarchy will appear as merely a quantitative difference between various financial assets. It is this transformation from quality to quantity that makes it possible to construct theories of economics and finance that abstract from the hierarchical character of the system as many do. The hierarchical character remains, and shows itself from time to time, especially when the market makers are not doing their job well, such as during periods of financial crisis or under the extreme stress of war finance. A fluctuation in the natural hierarchy shows up as strain on the market making institutions. A narrowing of the hierarchy means an increased qualitative differentiation between credit and money and a pressure on the quantitative price of credit in terms of money. Interest rates change to reflect that stress but that quantitative change is not necessarily equilibrating, and it may make the strain worse. Par is a price that does not change and under a fixed exchange rate system the same is true internationally. The banking system thus comes under stress as the natural hierarchy fluctuates because it is bound to defend the fixed price between different layers of the hierarchy. Reserves are the first line of defence but not the only line of defence. Market makers tend to respond to fluctuations in the natural hierarchy of money and credit that are outside their control. Their behaviour tends to be driven by profit maximisation. Monetary policy should be executed with some objective in mind other than profit maximisation. Monetary policy should be an attempt to manage the natural fluctuation of the system for the general good. At a time when the natural hierarchy is flattening, instead of waiting for a financial crisis to reassert the scarcity of money, monetary authorities may try to reassert the scarcity by raising the Fed Funds rate. At a time when the natural hierarchy is very steep, monetary authorities may try to reassert elasticity by lowering the Fed Funds rate. The main policy instrument of the central bank is the overnight borrowing rate. There can be considerable slippage between that rate and the longer term interest rates on which important investment and spending decisions depend. 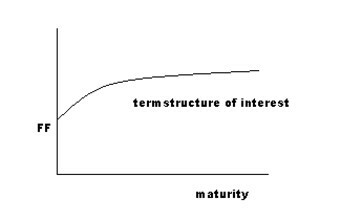 This is reflected in the term structure of interest rates. The definition of the general good that central banks try to promote has shifted over time. The first central banks focused their attention on managing the hierarchy to protect par and the exchange rate. If ordinary banks were having difficulty defending par, the central bank could help them out by providing additional reserves. This is the essence of the lender of last resort function. On the other hand, if the central bank itself was having difficulty defending the exchange rate, it could raise the interest rate in order to attract international reserves (gold). These interventions are natural objectives for a market maker that tries to safeguard the monetary system. Modern central banks have larger ambitions. They are typically concerned with managing the economy. But their actions only have impact if they succeed in influencing the natural hierarchy. Modern central banks may not be concerned with the shape of the hierarchy itself. They may be more concerned with how that hierarchy impacts the real economy, specifically aggregate demand and aggregate supply. Attempts to use monetary policy for non-monetary purposes can put strain on both par and the exchange rate, and on the institutions charged with maintaining quantitative equivalence between qualitatively different levels of the hierarchy. Standard analytical frameworks in macroeconomics (such as IS-LM) tend to abstract from such strains, and hence from the limits of monetary policy. In the situation of private money and private credit, a central bank may appear as a banker's bank. In reality a central bank is nearly always a government bank. The structure of the US banking system is the consequence of historical developments, most notably war finance in the Civil War and political constraints because of the American antipathy for central banking. Before the Fed was instituted, there was no official central bank, but there was a collection of New York banks that operated informally as such for their members. The private sector buys bonds from the government. The effect is a transfer of deposits from the private sector to the government so the government has more money to spend on the war. The bonds are a liability of the government and a new asset of the private sector. Deposits are an asset of the government or the private sector and a liability of the banking sector. The payment for the bonds is a reduction in private sector assets and an increase in government assets. In this case the banking sector is directly funding the government, not just transferring funds it is holding for the private sector. It is funding the government by expanding the money supply. The banking system swaps IOUs with the government, so it expands both sides of its balance sheet, and total deposit liabilities increase. The government inserted legal tenders between gold and bank deposits in the hierarchy of money. At the same time it broke the connection between the dollar and gold, since the legal tenders were not a promise to pay any specific quantity of gold. Over the course of the war, the legal tenders depreciated against gold. After the war was over, it took many years before the gold standard was resumed. Eventually the North possessed the creditworthiness required to float bonds. Once it did, bonds could be issued to buy gold, and that gold was used to retire legal tenders. The retirement of legal tenders brought the dollar back to its prewar gold parity, and also deflated domestic prices to prewar levels. It would have been much cheaper if the war had been financed by issuing bonds. This could have eliminated the politically and economically damaging effects of shifts of wealth between creditors and debtors caused by inflation and then deflation. The National Banking System was established in 1863 during the Civil War as another attempt to secure wartime finance. The overriding idea was to strengthen the market for government bonds. The idea was to issue special bonds that could be used to back the issue of bank notes, while at the same time taking measures that eliminated other potentially competitive note issues. The 2% interest on the bond appears unattractive to the banks but the banks have the right to issue bank note liabilities that pay 0% interest. The difference is profit. When the government pays out the deposits, the bank has the right to pay using bank notes that are its own liability. Banks would prefer to back their notes with higher yielding bonds, but the government took care of that by imposing a tax on all note issues that were backed by anything other than these special 2% bonds. This strategy for government purchase of war goods is financed by an expansion of private money or bank notes, which are promises to pay the new standard money, which are legal tenders and not gold. The bank notes were backed by the bonds. The bonds became the money supply. This money supply was fixed because the amount of bonds that could be used to back bank notes was not increased much. Strict reserve requirements made the money supply inelastic. Already in 1873 the United States experienced the first of a series of financial crises, which all followed a similar pattern. In slack times the farm banks would find themselves with excess funds for which they could find no local outlet. Those banks needed the funds during the fall. They deposited the funds in New York where they earned interest. The New York banks then found themselves with excess funds, which they also knew were only seasonal, so they wanted a short term investment. They would buy liquid securities or make short term loans, for example call loans made to stock market speculators. At harvest time there was a cash drain from the system, and also a cash drain from the New York banks, which was remedied by calling in loans and raising reserves from abroad. The cash drain spread into the stock market, causing selling by those who were using call loans to finance their speculative positions. It spread to the international money market, pulling in gold from London. The consequence was a seasonal pattern in interest rates, as the harvest expansion of credit took place on a fixed reserve basis. This also caused periodic financial crises whenever banks had to make cash payments but lacked the cash to do so. The problem was the inelasticity of reserves because they were money and not credit. If reserves were a form of credit that could be reduced in slack times and expanded in tight times, this problem could be solved. The banking system needed a temporary increase in reserves in times of tight money and a temporary increase in cash (for circulation purposes). Under the National Banking System, typically some kind of temporary measure was taken, for example an expansion of quasi-cash in the form of clearinghouse certificates issued by a consortium of New York banks. If banks agree to accept these certificates among themselves, then these certificates could be used as reserves. The effect was to free up cash for general circulation. The Aldrich Vreeland Act of 1908 created the legal basis for these ad hoc measures, but more was needed. Under the National Banking System, the quantity of cash was fixed. Under the Federal Reserve System it became elastic. The way it was supposed to work was that banks could take certain kinds of loans (so-called real bills) to their local Federal Reserve bank and discount them for Federal Reserve bank notes that could be used in circulation. The various reserve banks could also discount at the Fed itself to get Federal Reserve notes which were legal as well as economic reserve. Shifts in demand as between deposits and cash could thus raise no problems. Also cash drains into circulation would raise no problems. Total reserves could fluctuate elastically. The idea was that member banks could always get whatever reserves they needed by presenting one of their eligible loans to the local FRB for discount. In turn the FRB could itself always rediscount for Federal Reserve notes. If the amount of new discounts exceeded the repayment of existing discounts, then total reserves would expand. If repayment exceeded new discounts, then reserves could shrink. No longer would the system have too much reserves, fuelling speculation, or too little reserves, risking a financial crisis. World War I changed the picture. The Fed served as prime dealer for distributing government bonds, taking onto its own balance sheet whatever the private banking system and private bondholders would not absorb. After the war, instead of the planned elasticity driven by demand for discount of private credit the Fed used open market operations, which are an outright purchase and sale of government securities, to adjust the money supply to demand. The US monetary system is a hybrid system, comprised of both private money (bank deposits) and public money (currency). The central bank is also a hybrid entity, both a bankers' bank and a government bank. It is possible to build a monetary theory around either one of these dimensions, focusing on either the private dimension or the state dimension, and treating the other as subsidiary. Any such theory is only partial since it misses the true hybrid character of the system. Monetary thought is a story of getting the balance between these two dimensions right in order to capture the true dynamics of the system at any point in time. Sometimes the state dimension is dominant, for example during war time, and sometimes the private dimension is dominant, but all the time both dimensions are present. The quantity of bank money fluctuates over time as credit expands and contracts in order to facilitate the time pattern of trade. At every moment in time there is a balance between discipline, which is the consequence of the scarcity of money, and elasticity, which is the consequence of the availability of credit. In the first example, discipline comes from the limited quantity of money. In the second example, discipline comes from the bilateral credit limit. In the third example, discipline comes from the credit limit and terms imposed by the bank on each borrower, and the elasticity comes from the willingness of the bank to swap its own IOU's (which are money) for IOUs further down the hierarchy (which are credit). - avery agent's use is some other agent's source and every agent's source is some other agent's use. Example 2 shows the intimate connection between cash and credit in the payments system. There is much financial action needed in order to make goods and services transactions possible. Also credit provides elasticity by expanding to facilitate transactions. Money provides discipline by the requirement to contract credit after a certain time. The Fed Flow of Funds set of accounts is built on the sources and uses methodology. There is a lot of aggregation and netting, such as aggregation into sectors, netting within sectors and netting over time. For any agent, total uses and total sources must balance (column sums). And for any instrument, total uses and total sources must balance (row sums). This set of accounts was originally promoted by Morris Copeland as a possible framework for macroeconomic analysis as an alternative to the National Income and Product Accounts (NIPA accounts), which had been the basis of the Keynesian revolution (Y = C + I + G + X - M), and the traditional quantity theory of money (M * V = P * T). In NIPA accounts, the emphasis is on value added and employment, and the focus is on final production. But used goods are also exchanged as are financial assets. These exchanges are shunted off to one side by NIPA, but are at the same level of analysis in the flow of funds. The sale of goods and the sale of assets are equivalent ways of achieving a source of funds. In this accounting system, transactions include everything, not just final income transactions. The central concern of banking is not solvency but liquidity. If current cash inflows are sufficient to cover current cash outflow commitments then the survival constraint is satisfied. If not, then additional cash flow must be raised. There are three ways to do it: (1) spend down hoards of money, (2) liquidate accumulations of financial assets or (3) borrow, and build up additional stocks of financial liabilities. Both (2) and (3) depend on finding someone else to take the other side of the trade, and that may be impossible or extremely expensive in times of crisis. In times of crisis only (1) is dependable. That is why reserves are important. In all cases, cash inflows are greater than cash commitments. In the first case the survival constraint is met in every single period. In the second case the survival constraint is met in future periods but not the current period, so there is a current problem. In the third case, the survival constraint is met in current period but not in a future period, so there is a potential problem. At any moment in time there are agents in the economy who fit into each of these cases, and all of them meet in the money market. The ones with a current mismatch are necessitous borrowers. They have to borrow no matter what it costs. The ones with future mismatch may enter the money market today in order to avoid future problems or they may decide to wait. The ones with current liquidity may decide to help the others out, or they may decide to do something else. The result of all this is the money rate of interest. The economy can be seen as a system of interlocking balance sheets in which individuals depend on one another's promises to pay (financial assets), and build these promises into their own projections of future cash flows. In the economy as a whole there is a pattern of cash flows emerging from the real side, which consists of production, consumption and trade. There is also a pattern of cash commitments in the financial structure. At any moment there is a balance between the two, which shows up as a price (interest rate). The mismatch between cash commitments and cash flows can be seen in the current pattern of payments. That current pattern reflects also a forward looking view since people can anticipate problems they may face in satisfying the survival constraint in the future. This can put current pressure on the money market today even though there is no problem making current payments. The state of the money market indicates how well or poorly the structure of financial commitments matches the pattern of cash flows, not just today but also in the future. To make this assessment, assets and liabilities must be valued. Standard finance theory approaches this problem of valuation as a matter of finding the present value of future cash flows. It is possible to include real assets, since they presumably have future cash flows. From a financial point of view, a factory is nothing more than a set of cash flows . A problem occurs when someone with an account in bank A wants to make a payment to someone with an account in bank B. Banks could transfer reserves for each payment, but this is cumbersome, most notably if the reserves are gold. Instead, banks could sum all payments for one day to each other, and transfer the net balance in reserves. This is called bilateral intraday netting. In the first case total deposits and interbank balances fall, while in the latter case total deposits and interbank balances rise. In practise, the more important banks accept deposits from the less important banks. In the US country banks held deposits with city banks. These reserve cities became the cities with one of the twelve Federal Reserve Banks. The invention of correspondent banking amounts to moving from a money payment system to a credit payment system between banks. Since the correspondent system is a credit system, it is not constrained by the quantity of gold, but only by the various bilateral credit limits. Individual banks may at the same time be making payments to one bank while receiving payments from another. It is advantageous to have a system where every bank only had to pay the net across all its correspondents. This can be achieved with a clearinghouse, in which banks of approximately equal stature in the hierarchy come together to form a mutual organisation, owned by their members in proportion to capital subscribed. During the day all members net payments multilaterally with all other members, building up intraday credit or debit balances against the clearinghouse. At the end of the day each member makes or receives only a net payment, depending on whether the net is negative or positive. Settlement involves transfer of clearinghouse certificates, which may require prior bilateral borrowing between deficit banks and surplus banks. All members guarantee all payments. The entire capital is available to make good on the negative clearing of a member in case the member itself cannot. The clearinghouse policy committee often has powers to help individual banks, by lending from the clearinghouse or coordinating accommodation through other banks. In such a situation intraday deficits and surpluses are not paid but put off to another day. Typically these member loans are over-collateralised and pay a high interest rate, for example 6%. The clearinghouse loan certificates pay the same high interest rate. The clearinghouse loan certificates are not legal reserves, and did not represent gold at the time of the gold standard, but in a crisis they are treated as similar to the clearinghouse certificates, which are legal reserves, or gold at the time of the gold standard. After the crisis they are liquidated. The central bank makes the system of banks operate as though it were a single bank because all banks have clearing accounts at the central bank. Two kinds of problems can still arise. Bank customers may demand payment, so reserves flow out of the banking system into circulation as customers demand currency. This is called an internal drain. More difficult to manage is an external drain, where foreigners demand payment in reserves (gold). The primary job of the manager of a bank's Fed Funds desk is to ensure (1) that the bank settles with the Fed and (2) that in doing so, it holds no more excess reserves than the amount, if any, that it can carry into the next week. This can be understood as (1) satisfying the daily survival constraint and (2) satisfying the legal reserve requirement. The survival constraint implies that cash inflows must be at least as large as cash outflows. For banks, this results in the requirement to end the day with a non-negative balance in their reserve account at the Fed. Banks are allowed to relax the survival constraint during the day as this is essential for the smooth working of the payments system. It allows banks to make payments before they receive payments. This is called a daylight overdraft. This expansion of reserves is an expansion of credit on the balance sheet of the Fed, and it typically exceeds the size of the required overnight reserves. These daylight temporary reserves, and not the overnight required reserves, are the ultimate means of payment. This payment system is much closer to an ideal credit payment system than it is to an ideal money payment system. Both the Fed and CHIPS try to make sure that the daylight loans are paid back at the end of the day. There are controls over how much a bank can borrow (credit limits) and requirements to post collateral as guarantee. At the Fed there is the additional requirement to pay interest on the average daylight overdraft. Every dollar owed as an overdraft by one bank is an extra dollar in the reserve account of some other bank. To get the credit off the balance sheet of the Fed at the end of the day requires cancellation of both negative accounts and positive accounts. The simplest way to do that is for the banks with positive accounts to lend their extra to the banks with negative accounts, which then use the loan proceeds to pay off their overdraft. Interbank borrowing and lending for US banks takes place at the Fed Funds market. The equivalent interbank market for CHIPS is the Eurodollar market. If a bank is unable to pay back its overdraft at the clearinghouse, then all the members of the clearinghouse are jointly responsible for the loan. If a bank is unable to pay back its overdraft at the Fed, the Fed is willing to extend the loan overnight by lending at the discount window, at the penalty rate above the Fed Funds target. The transaction amounts to a loan from Bank B to Bank A. After lending Fed Funds to Bank A, Bank B has gotten rid of its excess reserve position at the Fed. After borrowing Fed Funds from Bank B, Bank A has gotten rid of its deficit reserve position at the Fed. Like daylight overdrafts, Fed Funds are a credit element that lends elasticity to the payment system. But Fed Funds are overnight credit and not daylight credit, and Fed Funds are interbank credit and not Fed credit. Some banks are natural sellers of funds and others are natural buyers. The regular business of some banks causes their daily cash inflow to exceed their daily cash outflow, and for some other banks it is the reverse. Small banks in isolated areas often do not face much demand for loans, while large city banks often can lend out all their deposits and even more. A Fed Funds transaction involves an immediate flow of reserves between banks. Once Bank A has bought the money, it can go out and sell it. Transactions like this happen throughout the day, and so the quantity of Fed Funds contracts and increases throughout the day. They are all cancelled when they are repaid the next day, but by the end of the day outstanding Fed Funds credit can be several times as large as the outstanding deposits at the Fed. The transaction starts out with the loan, which involves a swap of IOUs between John and his bank (1). Then there is the the immediate funding of the loan by buying money from Intermediary Bank (2). The next step is the payment that involves transfer of reserves from Money Centre Bank A to Money Centre Bank B, as well as a debit of John's account and a credit of Mary's account (3). Money Centre Bank B may choose to loan out its excess reserves to Intermediary Bank (4) via the Fed Funds market. Intermediary Bank has acted as an intermediary for interbank borrowing between Money Centre Bank A and Money Centre Bank B. In fact Intermediary Bank has acted as a dealer in the wholesale money market. After this settlement, Money Centre Bank A may look for other means of funding the loan while Money Centre Bank B may look for other ways of using its excess reserves. A broker puts together potential buyers and sellers. Brokers keep lists of the prices bid by potential buyers and offered by potential sellers, and they look for matches. Dealers take positions themselves. They buy funds at a lower price and sell them at a higher price. This sometimes means bridging different segments of the market, such as small versus large, unsophisticated versus sophisticated and domestic versus offshore. It sometimes also means bridging across time. Dealers are doing arbitrage and so creating a single price. They are also making markets. Dealing activity expands the balance sheet of the dealer, while brokering does not. Banks are required to hold a certain fraction of deposits in reserve (on average over the reserve maintenance period) and they can voluntarily pledge to hold more than that. The banks holding more reserves than required are the money centre banks, and they do this to facilitate the very large volume of transactions they are involved in. Nowadays this constraint does not bind, but it is nonetheless of historical interest. In 1984 there was a monetarist inspired shift to contemporaneous reserve accounting from lagged reserve accounting. Lagged reserve accounting meant that banks had to accumulate reserves as a fraction of past deposits. Since the demand for reserves was therefore completely inelastic, the Fed was forced to provide them, either through open market operations which made them available through the Fed Funds market, or through the discount window. According to monetarist thinking, the problem with open market operations was that it made the supply of reserves endogenous. The monetarists wanted banks to adjust deposits to fixed reserves, rather than vice versa. In recent years the Fed supplies whatever reserves are needed to hit the Fed Funds target. This involves the Fed in practically daily interventions in the market . These daily interventions are adjustments of the size of the Fed's balance sheet. If the Fed is adding reserves, that means that the daylight expansion of credit on Fedwire does not have to collapse back to zero at the end of day. The Fed is taking some of that credit onto its own balance sheet overnight or longer. The Fed does these daily adds usually by lending to securities dealers in the repo market. If the securities dealers lend out these extra reserves, this amounts to an additional supply of credit in the Fed Funds market, which puts downward pressure on the Fed Funds rate. A repurchase agreement or repo is a collateralised overnight loan. On the first leg of the repo, money flows from the lender to the borrower and securities flow the other way. On the second leg of the repo, the securities flow back to the borrower, and somewhat more money flows back to the lender. A reverse repo is a repurchase agreement that is an asset of a dealer. The instrument is the same but the dealer takes the opposite side of the instrument . Security dealers are between most repo transactions. They are either borrowing money by using securities as collateral or lending money by taking in securities as collateral. Corporations and pension funds invest in repo (make overnight secured loans to security dealers) as a way of earning interest on their money balances, and banks repo their security holdings because it is often the cheapest way to finance them. The Fed Funds market consists of interbank borrowing. The repo market is open to anybody that owns eligible collateral. The Fed Funds market is largely a direct or brokered market. The repo market is largely a dealer market. The most important dealers are the primary security dealers whose balance sheets are monitored by the Fed. By serving as the counterparty for most repo transactions, dealers serve to make a unified and relatively homogeneous market out of what would otherwise be extremely fragmented and heterogeneous (various counterparties, various collaterals, various maturities). Like Fed Funds dealers, repo dealers can be thought of as market makers. The legal construction as paired security transactions makes the transaction is more symmetric than an ordinary collateralised loan. The lender of money does often have the right to sell the securities (or the right of re-hypothecation). The price at which the security in a repo is transferred, is lower than its market price. This means that the money lender gets control over more securities than a clean purchase would allow. That difference can be seen as a margin or haircut. Margin is a symptom of the money-credit hierarchy. For example, a 10 year Treasury bond trading at 100-29/32 plus accrued interest is used as collateral for an overnight repo. The haircut is 2%, so the borrower gets only 99.228 for the collateral. The agreed overnight interest rate is 4.92%, which means that the borrower has to pay 99.228*(1+.0492/360)=99.228137 the next day in order to repurchase his securities. The overnight interest on an approximately million dollar loan is about $137 . Money market convention treats the year as having only 360 days. Interest is not compounded, so a 3 day repo would pay back [1+.0492*(3/360)] . The repo market is a dealer market. Securities dealers are bringing buyers and sellers of securities together, and absorbing the mismatch on their own balance sheets. In general security dealers borrow more than they lend in the overnight market (repos > reverses), but lend more than they borrow in the term market (repos < reverses) . Securities dealers are in the business of borrowing shorter term to lend longer term, providing liquidity to the market in much the same way banks do. Unlike banks securities dealers are specialists in the very short end of the money market term structure. Economists are used to thinking of the Fed as engaged in open market operations by buying Tbills when it wants to increase the supply of reserves, and selling when it wants to contract. On a daily basis, the Fed is involved in ensuring elasticity of reserves by standing ready to soak up excess and meet temporary demand. The Fed does repo (buys Tbills for resale, lends money) when it wants to temporarily increase reserves. When it want to decrease reserves, it does MSP (matched sale purchase). MSP is like a reverse, but since a reverse is understood as borrowing money, the Fed wants to make it more symmetric. An MSP is legally two distinct sales. In general the overnight repo rate is lower than the overnight Fed Funds rate, and higher than the three month Treasury bill rate. Stigum observed that repo is secured credit whereas Fed Funds is unsecured, which may imply a higher Fed Funds rate. Many economic entities cannot invest in Fed Funds but can invest in repo. This may push repo rates below the Fed Funds rate. There are plenty of agents who can borrow at the repo rate and lend at the Fed Funds rate, so arbitrage could fill the gap. Professor Mehrling sees the Fed Funds rate as a penalty rate that security dealers have to pay if they are unable to meet their survival constraint by borrowing at the repo rate. Dealers expand their balance sheets to the largest extent possible on thin capitalisation, while holding essentially no cash reserves, depending instead on the repo market to raise cash as needed. If they find themselves with insufficient collateral for additional repo borrowing, they rely in the first instance on their clearing banks for a dealer loan, which is priced over Fed Funds since the bank depends on the Fed Funds market to fund the loan. That is for occasional last minute emergencies. More routinely, dealers can rely on the Fed for a repo loan priced at the Fed Funds rate, since that is the rate that the Fed is trying to establish with its daily intervention. At the morning auction, dealers bid for the money. Bids that are below the Fed Funds rate are not attractive to the Fed. It wants to supply needed reserves, but also to retain discipline in the market by keeping reserves scarce. It does so by accepting bids that are at or above the Fed Funds rate. Securities dealers are willing to bid above the market repo rate, even if they finance most of their needs at the market repo rate, as long as they face any probability of having to ask for a dealer loan from their bank, which typically charges rates above the Fed Funds rate. The end result is that the Fed Funds rate tends to be above the repo rate. This reflects the natural hierarchy of money and credit. Eurodollars are dollar balances held by banks and branches of banks outside the United States. Those banks and branches hold no reserves at the Fed and do not have direct access to settlement through Fedwire. Eurodollar balances settle on the private CHIPS network. In the process of creating Eurodollars no reserves are leaving the United States. Assume that Local Corporation is making a payment to Foreign Corporation. Local Corporation uses Local Bank for payments. Local Bank is a correspondent bank of Chase NY. Foreign Corporation uses Foreign Bank for payments. Foreign Bank is a correspondent bank of City NY. The money does not leave the US as the reserves stay at the Fed. Instead, the account of Chase NY with the Fed is debited while the account of City NY with the Fed is credited. Also the deposit account of the foreign bank at City NY is credited. To Foreign Bank its deposit account at City NY are reserves, so Foreign Bank can make US Dollar loans on these reserves. Stigum has a similar example . From the point of view of the Fed, all that has happened is a debit from the account of Chase NY and a credit to the account of Citi NY. On the other hand, the transaction gives rise to dollar balances held outside the United States that could have been held inside. In the US there has been an expansion of the balance sheet of Citi NY and an equal contraction of the balance sheet of Chase NY. Outside the US there has been an expansion of the balance sheet of Foreign Bank and no corresponding contraction. Foreign Bank now has dollar reserves so it can now proceed to do dollar denominated banking business outside the United States. The Eurodollar market emerged for two reasons. First, the dollar was the most important international currency, so people outside the US needed to make and receive payments in dollars. Since the payment system is a credit system, there is need for an interbank market that links deficit and surplus agents, analogous to the Fed Funds market. Historically there were capital controls that hindered the free movement of dollars in and out of the US. There were also regulatory controls on dollars held inside the US. The Eurodollar market sprang up to provide a service outside the control of US authorities. Most barriers have been lifted but the Eurodollar market remained. The Eurodollar market is more than a dollar payment system. It is also the world funding market. If you need to raise money for a domestic project that cannot be financed domestically, you can borrow in dollars. In this market foreign banks take deposits and make loans and act as money dealers in the global dollar market. The Fed uses monetary policy to influence the US economy. For this, the Fed focuses its attention on the domestic money supply and domestic interest rates, leaving largely out of consideration the international money supply in the Eurodollar market. The idea is that these balances are held by foreigners and not by domestic consumers and businesses. This is an increasingly difficult abstraction since many important entities are global. Both banks seek to match their books. This means that their dollar liabilities are the same as their dollar assets. That protects them from any change in the value of the dollar. When their natural customer positions offset, banks can achieve matched book by trading with each other in the interbank market. This is an unsecured interbank borrowing like Fed Funds, and like in the Fed Funds market, banks control the counterparty risk by controlling their credit lines to one another. It is not enough to match total assets and total liabilities because of the special vulnerability of the Eurodollar market to liquidity problems because of its lack of access to the Fed’s balance sheet. The liquidity of the Eurodollar market ultimately depends on the ability and willingness of the New York banks to provide liquidity as needed by taking the problems of the Eurodollar market onto their own balance sheets. Uncertainty about that ability and willingness makes the Eurodollar banks take care to line up the time pattern of cash inflows and cash outflows, in order to minimise their need to use reserves. That is the reason that Eurodollar deposits are made to specific dates, with no early withdrawal permitted. The bank wants to know precisely when the cash outflow will happen, in order to prepare to meet it. Sometimes the dates of cash inflows and cash outflows do not line up. The most important instrument for that situation is the Forward Rate Agreement (FRA). An FRA is an off-balance sheet instrument that is a side bet on the value of LIBOR at some date in the future. To understand derivatives like the FRA it is helpful to imagine what they would look like as an on-balance sheet instrument. Suppose that these two IOUs have exactly the same value, so no money changes hands. Also, over the next two months the interest rate is the same, so again no money changes hands. But two months from now one deposit matures, which involves a cash flow from Bank Y to Bank X. X uses it to make a loan, Y uses it to invest a deposit. Five months from now the other deposit matures, which involves a cash flow from Bank X to Bank Y. This pattern of cash flows is exactly what the banks need in order to hedge their natural positions. Two months from now Bank Y gets a customer deposit, and pays it to Bank X, which uses it to make a customer loan. Five months from now the customer repays the loan to Bank Y, which sends the money to Bank Y. At the end of the day, it is the three month deposit that funds the 3 month loan, but the on-balance sheet operation allowed the banks to set it up ahead of time. There is a more efficient way to get the same job done. The FRA nets out the principal that is paid from Y to X in two months, and back again the other way in five months. Instead, the difference between LIBOR and F% two months from now is paid. The principal payments have been eliminated so FRA agreements can be off-balance sheet agreements. Bank X plans to fund the loan by borrowing at LIBOR, and Bank Y plans to invest its deposit by lending at LIBOR. By engaging in a FRA that pays the difference between LIBOR and F%, both banks manage to lock in an interest rate of F% for the funds in question. Bank X does not care how high LIBOR might go and Bank Y does not care how low LIBOR might go, as long as the liquidity is there so they can raise and invest the principal amounts as needed. What rate F% is appropriate for the transaction? The effect must be to lock in the cost of funding the future loan, and the benefit from accepting the future deposit. Both banks have an interest in getting the number right, even though Bank X would like a low number and Bank Y would like a high number. What number will be chosen? The notation is that R(0,N) is the rate of interest on a deposit extending from now to N (2 months in the example). R(0,T) is the rate of interest on a deposit extending from now to T (5 months in the example). F(N,T) is the implied forward rate on a three month deposit two months from now. FIP is an arbitrage condition. This means is that if the actual forward rate on a FRA had been different from the implied forward rate, there would be opportunities for riskless profit by lending at the higher rate and borrowing at the lower rate. Therefore, the market forward rate tends to be very close to the implied forward rate. There are also Euro markets in other major currencies such as the euro, the pound sterling, and the yen. The existence of these other markets provides more freedom for bankers to line up cash inflows and outflows. If the desired timing is not available in one currency, it may be available in another currency. In that case there is a potential mismatch in currency exposure that gave rise to the foreign exchange swap, which permits banks to trade out of any currency mismatch they may have. This balance sheet operation leaves the bank with completely matched book, both over time and across currencies. In six months it will be receiving yen (from the loan) and paying out yen (on the swap), and receiving dollars (on the swap) and paying dollars (on the deposit). The swap of IOUs has zero value at inception. This can be shown in a number of steps. The first step is to open accounts that have the same current value according to the current exchange rate, for example 115 yen for every dollar, S(0). After six months the accounts will be closed and there will be a different exchange rate. It is possible to fix a notional rate F(T) today that makes the present value of the two accounts exactly the same. At the time of inception, there is a prevailing interest rate for Euroyen, R*, and a prevailing interest rate for Eurodollars, R. A Euroyen account with 115 yen will grow by the rate R*, and a $1 Eurodollar account will grow by the rate R. These accounts would have the same value six months from inception if the exchange rate changed by the right amount to counter the interest rate differential. The future exchange rate that makes these two accounts have the same value today, is the exchange rate F(T) that satisfies Covered Interest Parity (CIP). The left hand side is the yen value of the yen account at maturity, and the right hand side is the yen value of the dollar account at maturity. Like FIP, CIP is an arbitrage condition, so the actual market forward exchange rate usually is very close to the forward exchange rate that is implied by this formula. - Time T: [1+R*]S(0) yen from bank to counterparty, [1+R] dollars from counterparty to bank. If the actual exchange rate S(T) = F(T) then the cash flows at time T are exactly offsetting in value terms. But if S(T) > F(T) then a dollar buys more yen, so the cash inflow to the bank (from the swap) is worth more than the cash outflow (from the swap). And if S(T) < F(T) then a dollar buys less yen, so the cash inflow to the bank is worth less than the cash outflow. A swap contract is an off balance sheet method of achieving the exact same net cash flows as the on-balance sheet swap of claims. At time 0, the two parties swap yen for dollars at S(0) and agree to swap back again at F(T). In the case of the FX swap, the principal payments cannot be netted because they are in different currencies, and that is different from the forward interest swap. The effect of the FX swap is to shield the bank from any fluctuation in the yen exchange rate. If the yen falls in value, the bank loses on his Euroyen loan but gains on the offsetting swap. If the yen rises in value, the bank gains on his Euroyen loan but loses on the offsetting swap. The expectations hypothesis of the term structure suggests that the forward rate should be equal to the expected future spot rate, or: F(N,T) = ER(N,T). In practise there tends to be an inequality and usually F(N,T) > ER(N,T). Bank X usually would have done better by borrowing funds as needed in the spot market. Bank X is willing to lose money because it is paying for insurance. The borrower pays the insurance, not the lender. This is a symptom of the hierarchy of money and credit. Since the forward exchange rate can be locked in today, it seems reasonable to expect it to bear some relationship to the expected future exchange rate. Uncovered Interest Parity (UIP) suggests that they should be equal, which means that F(T) = ES(T), or, using the CIP relationship, that (1+R*)/(1+R) = ES(T)/S(0). Suppose that R* < R, so the yen is a relatively low yielding currency. UIP says that the dollar can be expected to depreciate against the yen (yen to appreciate against the dollar) by just enough to make both currencies have the same yield, at least ex ante. It does not hold up in practise, and most often there is a violation of UIP. If F(T) < S(0), [i.e. R > R*], then F(T) < ES(T). Usually the low yielding currency does not appreciate by enough to give it the same yield as the high yielding currency. Another possibility is that the bank does not discount the bill but only accepts it, which means committing to pay the bill at maturity in case Firm A does not pay. Acceptance is a kind of guarantee, which is a contingent liability of the Bank and a contingent asset of Firm B. Firm B pays for this guarantee, but in return gets an interest bearing asset. Both mechanisms economise on scarce notes (money). In the first, the bank finds a way to discount without paying out notes. In the second, the Firm finds a way to ensure access to future cash without demanding any present cash. Suppose that the bank is doing business not just with Firm A and B but with lots of other firms, and suppose there are lots of other banks too. On any given day it is both extending new discount loans, and receiving payment from maturing discount loans, so notes are flowing in and out. The whole secret of successful banking of this type is to match these inflows and outflows while keeping (non-earning) note balances as low as possible. In order to do this, the one thing the bank can control is the discount rate. 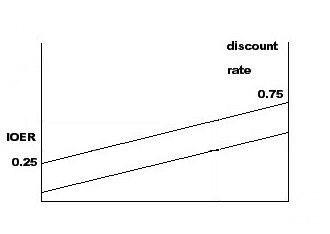 If it finds that requests for discount are exceeding its available note capacity, it can lower the price it is willing to pay (which means raising the discount interest rate). The effect should be to discourage new discounts relative to repayment of old ones, and hence a shift toward net inflow of notes. Each bank is moving its own discount rate up and down in order to achieve the desired net flow of paying assets. If any bank finds itself with too many notes, it may lower the discount rate in order to attract new discounts. If it finds itself with too few notes, it may raise the discount rate in order to discourage new discounts. In the system as a whole multiple rates encourage holders of bills to seek out one bank or another. Banks themselves may borrow and lend notes to and from one another by using rediscount. The discount banks are acting in effect as dealers, quoting a two-way market for bills of exchange and meeting the resulting flow of demand and supply by altering their own inventories and balance sheets. Individual dealers set their own prices, with a view to managing their own inventories, maximising profits and controlling exposure to liquidity risk. Competition and arbitrage ensure that the multiple rates are coordinated around a single rate, which is the market rate of interest. The market rate of interest fluctuates depending on the market wide balance between cash inflows from maturing bills and cash outflows from new discounts. When discount pressure is high, or when firms are having difficulty repaying, the market rate of interest rises. The effect of this division was to fix the note issue in aggregate, which is a source of discipline. The elasticity in the system comes from the willingness of the Bank of England to hold more note reserves than it really needs, and to make them available to other banks through the discount mechanism. A further source is the elasticity of deposits, which other banks are able to use as reserves when notes are scarce. Individual banks are encouraged to take on liquidity risk by the prospect of profit. A profit-seeking central bank would be in the same position. As in the system with a fixed quantity of notes, there will be a tendency for all discount rates to converge on a single rate. Whenever there is scarcity of note reserves (i.e. "money is tight"), the central bank is in a position to affect the interest rate as a matter of its own policy. It may take the view that there are sufficient notes outstanding already, and set its rate sufficiently high that net demand for rediscount is minimal. It may decide to set a lower rate and allow its balance sheet to expand. The central bank may use the rediscount rate to control the rate of that expansion. On the other hand, it may take the view that there are excessive notes outstanding, and set its rate so high that net demand for rediscount is negative, so contracting its balance sheet, and it may use its discount rate to control the rate of contraction. The bank rate thus moves as the result of policy decisions, while the market rate moves as the consequence of market forces. This is the origin of monetary policy. The central question is how the central bank decides what is the right rate of discount. A central bank is at a level above other banks. 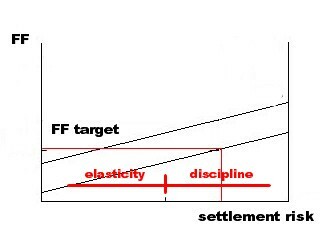 The ability of the central bank to relax the survival constraint for banks lower down in the hierarchy brings with it responsibility for managing the balance between discipline and elasticity, choosing when to relax the constraint and also when to tighten it. In times of crisis, bills are not repaid on time so banks face a reduction in cash inflow. Unless they can replace that cash inflow by discounting at the central bank, they will be forced by the survival constraint to curtail their own discounts, and the result will be a general credit contraction and perhaps a cascade of payment failures. To cope with this possibility, the central bank holds excess reserves for the system as a whole. The Bagehot Principle states that in times of crisis central banks should lend freely but at a high rate. In the face of an internal drain, the job of the central bank is to lend out its own note reserves and possibly even to create additional deposits as a substitute for notes. The high rate is needed to make sure that banks asking for accommodation really need it, and to provide incentive for them to pay back as soon as conditions return to normal. The central bank can help with an internal drain because it stands above other banks, but the same is not true of an external drain. Suppose the demand for discounts at the central bank is coming from people who really want gold, so they convert the notes they receive into gold and take gold out of the country. The central bank cannot fix this issue by paying out freely, or by expanding its own balance sheet. People do not want notes or deposits, they want gold, the international reserve. The Bank of England was a credit operation built on an extremely small foundation of gold reserves, so any incipient gold outflow called for immediate action. Because of the enormous volume in the bill market, there were always bills maturing and new bills being offered. All the central bank had to do to forestall a gold drain was to make new borrowing slightly less attractive by raising the rate of interest, which is the same thing as lowering the price of bills. Then maturing bills were not replaced but paid and the resulting gold inflow stemmed the tide. Bagehot was focusing on the discount rate as defence of the rate of exchange under the gold standard. When the Bank of England tightened, it contracted not only its own balance sheet but also the balance sheets of all other banks below it, which tightened credit in the entire country. Thus, to some extent, domestic credit policy was subordinated to the dictates of the gold standard, at least whenever those dictates were binding. The distinction between external drain and internal drain is an early attempt to find the appropriate balance between discipline (external) and elasticity (internal). The distinction makes practical sense in a gold standard. From a larger perspective, gold flows between countries have no more effect on the aggregate world gold stock than internal flows have on the domestic gold stock. There is no necessity for the scarcity of gold to constrain the system as a whole. This would require cooperation between central banks. The system does require some overall disciplining factor. A liquid market is a market in which an individual transaction does not disrupt the continuity of the market. It is a market in which it is possible to buy and sell (1) quickly, (2) in volume, (3) without moving the price much. This feature of markets is crucial for the smooth operation of the economy, so crucial that it tends to be taken for granted. Microeconomics revolves around the idea that suppliers and demanders are trying to find the optimal supplies and demands given the market price. A liquid market therefore has continuity in the time path of the market price. There are no jumps or gaps as price evolves over time. How do a liquid markets emerge? How do merchants manage to do it? Merchants take delivery of a large quantity of a particular good, set the price so as to ensure a profit on the load, and then proceed to supply individual demanders from the inventory until it runs sufficiently low that they make another order. Merchants choose their inventories on the assumption that it can get resupply and that resupply depends on inventories somewhere else in the system, and so forth all the way back to the factory or the original producer. The continuity of the market price for a particular good seems to depend on a hierarchical structure of inventories. The consequence for retail trade is a liquid market, meaning the ability to buy or sell without moving the price. The hypothetical dealer has inventories of cash and securities, and uses those inventories to absorb fluctuations in demand and supply. Any increase in one inventory is matched by a decrease in another. The result is that imbalances in the time pattern of demand and supply show up as balance sheet changes, not price changes. One way to appreciate what dealers do is to think about what would happen without them. Imbalances in supply and demand would cause prices to jump around, or force ultimate suppliers and demanders to wait for the opposite side. The security market would be like the housing market in which individual buyers have to find individual sellers and negotiate individual deals. In the securities market, buyers and sellers can find a dealer, and the dealer takes the opposite side of their trade. The dealer makes liquid markets by buying when there is excess selling pressure, and selling when there is excess buying pressure. So the dealer is buying at a price higher than would otherwise be (higher than if excess supply had to drive prices down far enough to attract demand), and selling at a price lower than would otherwise be (lower than if excess demand had to drive prices up far enough to attract supply). The dealer has to pay attention to these prices to survive, and make sure that he or she is not paying too much or selling for too little. Dealers smooth prices and make continuous markets out of discontinuous order flow. The offer (selling price) is above the bid (buying price). The spread means that the dealer is always buying low and selling high. The level of both prices also changes with the inventory. By lowering the price at which the dealer is willing to add to a large long position, the dealer protects himself or herself from the risk that price may fall. By raising the price at which the dealer is willing to add to a large short position, the dealer protects himself from the risk that price may rise. Three key elements make up this model. First, the position limits of the dealer. The dealer has limited capital, limited credit and perhaps a limited taste for risk. Second, there is an outside spread, which is the price at which value based traders (the ultimate suppliers and demanders) are willing to buy and sell. This is a wide spread, maybe 20% below and 20% above fundamental value as estimated by the value based trader. When the dealer hits the position limits, the value based traders become the market makers of last resort. Third, the volatility of price and the prevalence of adverse selection risk are captured in the position limits, max long and max short. 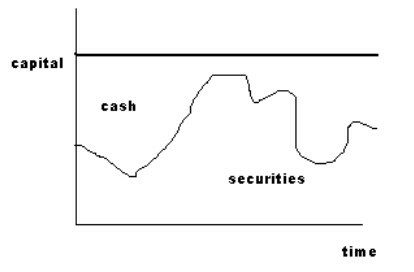 Outside the dealer balance sheet there are other agents holding inventories of securities and cash. The dealer accesses the inventory of securities using reverse and the inventory of cash using repo. The repo can be seen as borrowing money to finance the dealer’s long security positions, and the reverse as lending money (borrowing collateral) to finance the dealer's short positions. Dealers have very good access to cash (repo market) and to securities (reverse market) when they need them, so they can behave as though they do have inventories even though the inventories are actually out in the market some place. Ultimately access to cash comes from higher up in the hierarchy, from banks, and access to securities comes from lower down in the hierarchy, from security holders. So the dealer is in effect straddling layers of the monetary hierarchy. Sometimes they get into trouble when they have to come up with securities they have reversed in and then sold. The more significant troubles come when the dealer has to come up with money they have repoed in and then spent. Dealers depend on banks for refinance. In normal times dealers make the market between cash and securities, standing ready to take the opposite side of trades that others may wish to make. The business of making markets is sufficiently competitive that profits are hard to come by. The real profit in the business comes from trading on the information one gets from knowing the state of the market better than anyone else, and from having privileged access to both money and securities in the repo and reverse markets which means the ability to put on a position more cheaply than anyone else. Dealers take positions, which means that they speculate on how prices will change in the future. They may be net long securities if they are bullish on security prices, but mostly the trades are more subtle. They may be net long some class of securities and short another class, betting on the relative price be tween them. Sometimes this means betting on what the Fed will do, since the Fed influences the price of money in Fed Funds and all other markets depend on that. Sometimes this means betting what the market will do. An example is yield spread arbitrage, in which the dealer identifies an apparent mispricing at one segment of the yield curve, takes a position but hedges overall interest rate exposure by taking an opposite position at another segment of the yield curve. The initial distortion in asset prices that the dealer identified as offering an arbitrage opportunity can be understood as a (temporary) fluctuation in demand or supply. By taking advantage of the distortion, the dealer in effect spreads its impact into other markets, so reducing its impact, indeed counteracting the distortion. The consequence of arbitrage is that markets for individual securities are not separate, each with its own flow of supply and demand that causes price to fluctuate. Speculators are joining the separate markets into a single market, and in doing so they bring about a result that is no part of their intention, namely liquidity. Arbitrage and liquidity are in this sense two sides of the same coin. The modern theory of finance is built on the assumption of perfect liquidity so that prices can be fully efficient. It is supposed that arbitrage creates perfect liquidity by entering to take advantage of even the smallest deviation. To say that liquidity is perfect is to say that liquidity is a free good. Arbitrage would not be profitable in a fully efficient market, since all bets would be fair bets so position takers would not make money. If position takers do not make money, they will not compete so much for the market-making business. This seems to imply that if markets were less liquid there would be wider bid-ask spreads and more volatile prices. This creates opportunities for profit so it must be expected that liquidity enters into asset prices. In financial theory, it is common practise to assume perfect arbitrage and complete liquidity. Assets are assumed to trade at their fundamental value since any other price would create an arbitrage profit opportunity. In effect, the world that the finance theorists imagine is a world in which the value based trader outside spread is very narrow, so there is no room and need for dealers. In the real world, the outside spread is quite wide, dealers offer prices inside that spread but the prices can deviate very far from fundamental value. That is the world Fischer Black was talking about in his infamous presidential address to the American Finance Association when he said that he thought markets were efficient, meaning price was usually within a factor of two of true value. This can be understood using the Treynor model. Suppose that fundamental value is the price that dealers would quote if their inventories were exactly zero, so they are not exposed to any price risk. The Treynor model then shows how market making by dealers pushes price away from fundamental value, on one side or another, by more or less depending on the size of the outside spread and the dealer’s maximum long and short position limits. Standard asset price theory abstracts from this effect, in effect treating the outside spread as collapsed around fundamental value, so there is no need for dealers. Some markets are close approximations to this, but others are not; some times are close approximations to this, but others are not. The matched book part is comprised of equal and opposite long and short positions, so that fluctuation in security prices have exactly offsetting effects. Only the speculative book is exposed to price movement, and it is an order of magnitude smaller than the matched book. The dealer in the example is net long, and funding this net long position with loans. The data for primary dealers in the US shows their outright position, but not necessarily their actual exposure since it does not include derivative positions, so it is not possible to exactly translate between the conceptual distinction and the data. Net financing has been added as a balancing item, since borrowing is greater than lending. Net financing is not the same as the outright positions. One reason for that is the way that mortgage backed security positions are treated. It is possible to go further by distinguishing two different kinds of price risk on the speculative dealer side. Just add 515 term repo on the liability side and 515 term reverse on the asset side. In the money market, prices are quoted as yields, so the bid is higher than the offer and the dealer quote curves slope up rather than down. But the same idea applies, that the dealer is willing to take on more risk, in this case liquidity risk, only if compensated by higher expected return, in this case the difference between the term rate and the overnight rate. In the money market, prices are quoted as yields, so the bid is higher than the offer and the dealer quote curves slope up rather than down. The dealer is willing to take on more risk, in this case liquidity risk, only if compensated by higher expected return, in this case the difference between the term rate and the overnight rate. the security dealer chooses not only how much price risk to take (and chooses price quotes to achieve that) but also how much liquidity risk to take (and chooses yield quotes to achieve that). The dealer could take either less or more liquidity risk than price risk. This is similar to what banks do. 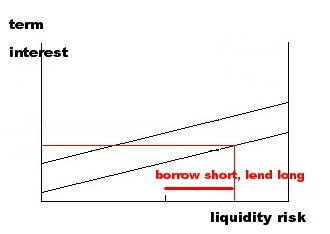 Overnight repo is analogous to a demand deposit account, and term repo is analogous to a short term loan. The Treynor diagram is not just about the determination of term repo rates, but also about bank term rates as well. Banks make money, in part, by issuing money as their liability and investing the funds they receiving in interest bearing securities. That is what dealers are doing too. Traditionally, a bank was an institution that makes loans to corporate customers and takes deposits from households retail. These are essentially passive activities. Where the action comes is in managing the difference between these two. If lending exceeds deposits (as is typical for money centre banks) then they must raise additional funds in the money market. If deposits exceed lending, then they must find profitable outlets for excess funds, typically some money market asset or longer term security. This traditional view sees banks as intermediaries between savers (household depositors) and investors (corporations). All the money market does is to move those deposits from banks with excess to banks with deficit, so in the aggregate what is happening is that deposits are funding loans. Banks are intermediaries that facilitate that movement, and also intermediaries in the sense that borrowers and lenders both face the bank, not each other. In this traditional view, banks are important mainly because of their role in fostering capital accumulation. This is a good picture of how banking operated in the 1950s. This description does not mention that government securities were a large portion of bank portfolios, so that much expansion of lending was replacing government securities with private loans. Things have changed. Stigum writes about the “death of loans”. Top corporate customers have access to open market credit, particularly commercial paper, where they can borrow more cheaply than banks. Banks have adjusted to the loss of this business by instead providing backup lines of credit to commercial paper issues. The second big change is the “death of deposits”. Reg Q helped to provide banks with low cost funds by limiting interest payment on deposits. This eroded over time with the rise of money market mutual funds as competitors. This development is called disintermediation. Ultimate borrowers and lenders began to take interest rate risk, without the bank standing between them. Banks were losing their core business, but at the same time they were prevented from going into any others. The Securities Industry Association (SIA) resisted bank attempts to get into underwriting non-exempt securities. The Fed imposes capital adequacy regulations on banks that are not imposed on others. This accelerated the tendency to strip the balance sheet, to go for off-balance sheet exposure, substituting FRA for deposits and futures for actuals. This apparent discrimination against the banks was in part motivated by concerns about safety and soundness of the payment system, and the fact that banks, unlike their competitors, have privileged access to the Fed, while the Fed wants to keep use of that access to a minimum. In the beginning of the 21st century this parallel banking system developed into a shadow banking system. There is a movement from bank credit to capital market credit. Corporations pioneered in this shift, but the latest development has been more about household credit, namely mortgage credit. The shadow banking system faces the same problems of liquidity and solvency risk that the traditional banking system faced, but without the government backstops (mainly Fed LOLR and FDIC deposit insurance). Instead the shadow banking system relies on the market for both, mainly the wholesale money market and the credit default swap (CDS) market. The lender of last resort to the shadow banking system is the traditional banking system, operating through various lines of credit and liquidity support commitment. The result is that the Banking system as a whole now has more reserves, which should ease some of the need to borrow reserves and hence lower the Fed funds rate. The Fed tries to keep the Fed Funds rate near the target by intervening daily. The outside spread is intended only for anomalous situations involving individual banks. How do banks manage to make markets in currency and deposits at a zero bid-ask spread and a price that is fixed at par, and how do they make profit doing so? The answer is that they are also in a complementary business, the business of bearing liquidity risk by issuing demand liabilities and investing the funds at term, and this business is highly profitable. Banks cannot change the price of deposits in terms of currency, but they can expand and contract the quantity of deposits because deposits are their own liability, and they can expand and contract the quantity of currency because of their access to the discount window at the fed. Security dealers are stuck with the quantity of securities out there, and stuck also with the quantity of cash out there. Although banks have less flexibility on price, they have more flexibility on quantity. In normal times, the Fed targets overnight rates, leaving term rates to be determined in the market. During the crisis the Fed did a lot of intervention in term markets, which broke down, mainly lending. In 2013 the Fed is experimenting with intervention on the other side of the market, by issuing its own term deposits. Walter Bagehot wrote in the 19th century that money does not manage itself, and that the City of London had a great deal of money to manage. Once the central bank took responsibility for crisis management, it was inevitable that it would take responsibility also for trying to prevent crisis by intervening well before any actual trouble. Being a lender of last resort is the logical as well as historical origin of modern money management. The Fed intervenes in two way. First, the Fed is using its control of money (at the top of the hierarchy) to influence the expansion of credit (at the bottom of the hierarchy). Second, the Fed is using its control of the money rate of interest (at the short end of the term structure maturity spectrum) to influence the bond rate of interest (at the long end). In both cases, the private credit market determines quantities and prices, but the Fed is an important player in that market and can influence it. Stigum wrote that standard economic theory has not a good answer to the question of how the Fed gets leverage over the real economy. The Fed knew that the Fed could not control money supply with the precision envisioned in textbooks. She also stated that much of the macro theory that links money supply to the price level depends on concepts that have little relevance to the workings of a modern financial system. She criticises the quantity theory of money (MV = PQ), which suggests that control of the quantity of money gives control over the price level and aggregate output. Stigum further suggested that the talk about reserves (free reserves, borrowed reserves, non-borrowed reserves) is a cover for what the Fed is actually doing, which is targeting interest rates. One constant is the Fed's idea that its job is to attend to the balance of elasticity and discipline in the monetary system as a way of controlling the flow of credit. Too rapid credit growth requires more discipline; too slow credit growth requires more elasticity. Operational practise changes, but the underlying goal is the same. Targeting excess reserves amounts to accommodation of changes in required reserves, and targeting borrowed reserves amounts to accommodation of changes in non-borrowed reserves. These quantity targets are not the strict quantity control favoured by the Currency School and modern monetarists. They involve accommodation in terms of quantities, but maybe not in terms of price. To maintain constant excess reserves, for example, the Fed may have to allow interest rates to change. The idea of these policies was to use the quantity target to exert pressure on the market, since banks do not like to borrow from the Fed, but to allow the market to determine the rate of interest. Where R is the target short-term nominal interest rate, ρ is the real interest rate, πe is the expected inflation rate, πt the target inflation rate, Y is economic output, YF is full employment economic output target, α is the central bank sensitivity to inflation target misses, β is the central bank sensitivity to economic output target misses. The first three terms of this equation express the idea of the Fisher Effect, which says that the private negotiations between borrowers and lenders tend to produce a nominal rate of interest that takes account of the expected rate of inflation. This is what the private markets tend to do on their own. Fisher himself thought that private markets tend to have money illusion, so they systematically underestimate future inflation, and hence mistake merely nominal interest rate changes for real interest rate fluctuations. In his view, monetary policy was mainly about correcting for these systematic mistakes. In recent times, economists tend to assume rational expectations, which means that the private forecast is as good as can be achieved from available information. They think that the problem is not that people make mistakes, but that their actions do not bring inflation under control. They merely accommodate it. The role of the central bank is to do more than that, by raising interest rates even more when inflation exceeds the target, and lowering even more when inflation falls below the target, which means that α > 1. The central bank imposes discipline when prices are rising too fast, and tries to instill some additional elasticity when prices are not rising fast enough. In the current crisis, the inflation targeting framework has come under question. Many people think that the central bank played a role in causing the credit bubble by keeping interest rates too low for too long, and that it did so because it was watching inflation not asset prices (housing prices). So there may be more evolution in thinking about money management, but that evolution will be about finding a more appropriate way to achieve balance between elasticity and discipline. There may be a return to Hawtrey, with an emphasis on the inherent instability of credit, operating through the effect of lending on collateral valuation. The leftmost describes how the Fed controls the Fed Funds rate. 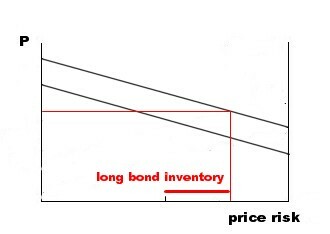 The rightmost is about how the market determines the price of long term bonds. 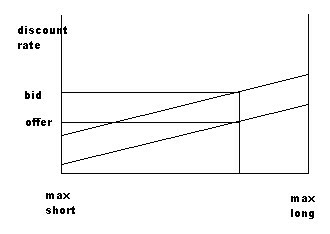 The middle diagram shows how both of these two influences come together to determine the term rate of interest. If the Fed wants to tighten, it raises Fed Funds target. That lowers the profitability of the liquidity spread in the middle diagram, unless the term interest rate rises by the full amount (and perhaps a bit more to compensate for anticipated future tightening). This is funding cost for bond dealers, so they are willing to hold existing bond inventories only at a lower price, hence higher expected profit. This is the chain of events in normal times. In normal times dealers swap IOUs with banks. The effect is to increase the means of payment, which the dealers use to pay the households. The households get the trade they want because the dealer system is prepared to take the opposite side of the trade. In order for dealers and banks to participate in this kind of action, they have to have an expectation of making money. Thus, dealers buy securities below equilibrium price, banks make loans above equilibrium price, and the distance from equilibrium is determined by the amount of risk they think they are taking. They will not be willing to do any of this unless they see a light at the end of the tunnel in terms of eventual return to equilibrium prices. The dealer system buys time by letting the private sector think that accounts are settling rather than being delayed. The private sector gets cash promptly instead of a promise of cash in the future. Accounts are not actually settling as new cash has been created for the purpose. From the perspective of the private sector, there is no difference between this cash and other cash. During the extended delay, prices are pushed away from equilibrium, and the disequilibrium prices put pressure on the system to settle as higher interest rates raise the cost of delaying payment. So although actual settlement is delayed, incentives are put in place to encourage more rapid settlement in the future. There are many times when the marketmakers face trouble of this kind and turn to the banks for refinance. The banks are able to meet the need without trouble, harvesting a nice return for doing so. In those cases liquidity crises for market makers did not turn into banking crises. These are cases of "normal crisis" where the liquidity constraint is doing its job of ensuring continued coherence in the economy. Just as the dealer system could take the problem off the hands (the balance sheet) of the households, so too can the Fed take the problem off the hands (the balance sheet) of the dealer system. It does so by expanding its own balance sheet. In such a circumstance, Fed lending can put bounds on the fluctuation of interest rates and so prevent the problem from spiralling out of control. If the Fed is willing to lend at 10%, then interest rates will not exceed 10%, and that provides a lower bound to asset prices as well. The discount rate, which is the interest rate paid by banks, is usually 100 basis points over the Fed Funds target. The interest rate charged by banks will be a markup over their cost of funds, not the same as the Fed lending rate. The Fed's willingness to lend to the banks as a rate lower than they would lend to each other makes it possible for the banks to lend to the dealers at a rate lower than they would otherwise charge. Putting a ceiling on the money rate of interest thus indirectly puts a floor on asset prices. In the recent crisis this transmission broke down and the Fed moved to put a floor on asset prices directly by buying them, not just financing their purchase by dealers. The Fed can help the banks by expanding reserves. Hence the money supply expands. Market makers are long securities and short cash. The Fed backstops those short positions by shorting cash itself. The Fed prints the cash itself so the Fed cannot be subject to a short squeeze itself. Internationally the Fed itself faces a reserve constraint, but only if the problem becomes so large that it cannot be solved within the United States. The Fed is a government bank. Banks meet the demands of dealers, first by expanding up to their reserve constraint, and then by replacing security holdings with loans. A liquidity crisis in any market tends eventually to get funneled into a demand for bank lending, and if that demand is high enough banks will eventually try to meet it by dumping their holdings of securities, which are mostly government securities. Government securities trade at a premium not only because they are default free, but also because of the liquidity of their markets. If the Fed fails to maintain the market for government debt, it would soon be under direct Congressional control. The Fed is also a bankers bank. Sharp moves of security prices and interest rates can disrupt balance sheets, especially leveraged balance sheets, and force emergency liquidation. As more securities get thrown upon the market, the initial dislocation gets larger rather than smaller. Throughout history lead bankers have stepped in to play a stabilising role in a crisis out of self-interest. Allowing liquidation to take its course can have even more profound effects in the macroeconomy. One way for borrowers to raise needed cash is simply by reducing their spending. But their spending is the income for other agents in the economy, and reduction in their income receipts may spread the debt repayment problem throughout the economy. An attempt to liquidate holdings of commodities may also drive down the price level, which may increase the burden of nominal debt and make it harder to repay. Under those circumstances, the natural mechanisms of the economy may make the problem worse rather than better. It looks like the Fed can solve any liquidity crisis simply by providing the needed liquidity. A liquidity crisis is typically a symptom of some underlying deeper problem regarding solvency. The Fed intends to buy time for adjustment, but not too much time so that people lose the incentive to make the adjustment. The problem of the Fed is to ensure enough price movement to put pressure on the system but not too much as it may make the problem worse. Minsky stated that at any moment in time the history of past borrowing and lending (based on expectations of future cash flows) has given rise to a certain pattern of cash commitments. At the same time, there is a pattern of cash flows emerging from the real economy. If these two patterns match, then debt is serviced and there are no problems. If the people who are receiving cash do not need it, there is no problem because they will lend it. The consequence is an expansion of credit. This is what happens in a boom. A boom is a credit expansion, which is a delay of settlement on the basis of expectations about the future. The problem comes on the reverse side of this expansion, when there are demands to delay settlement and no supply, or demands to make payment and no matching cash flows. Such a disjuncture between the pattern of cash commitments and the pattern of cash flows shows up as pressure in the money market, because it involves/requires an expansion of inside credit. What makes the problem worse (at least potentially) is that the cash commitments of each unit depend on the cash commitments of every other unit. Price movements in the money market may not be sufficient by themselves to bring the two patterns back into line with one another. The Fed could solve the immediate problem by providing liquidity. By preventing crisis the Fed may be preventing the adjustment that will ultimately resolve the underlying problem. If the Fed always meets the demand for liquidity, then it allows people to delay adjusting their balance sheets to their changed circumstances, so the discipline never comes and the imbalance continues. If the imbalance is prevented from showing up in a liquidity crisis, it will show up somewhere else, as for example in inflation. The Fed faces a dilemma. Providing liquidity may prevent a necessary adjustment. If it does not, the adjustment may prove fatal or at least more costly than it needs to be. This idea can be applied to the shadow banking system, and the stresses it experienced in recent years. In the first stage of the crisis (Fall 2007) money market mutual funds (MMMFs) refused to roll over asset backed commercial paper (ABCP). They wanted to convert their money market asset into cash. In the first stage of the crisis, this was handled by converting ABCP into repo, which was still secured funding but shorter term. In the second stage of the crisis (Bear, March 2008), repo became suspect as well. Haircuts were increased, forcing a shift to unsecured Eurodollar and Financial CP funding. In the third stage of the crisis (Lehman), these also became suspect. This set of balance sheets shows more or less the anatomy of a normal crisis. That was what everyone thought this was when it started. The Fed did not involve its own balance sheet, but it tried to encourage banks to involve their own balance sheets by cutting the Fed Funds rate from 5% to 2%. But this was not enough. The domestic action caused the Fed to liquidate about half of its holdings of Treasury bills. The international action caused the Fed to expand both sides of its balance sheet. The Fed got involved in supporting foreign banks. One reason is that they wanted to stop foreign banks from liquidating their holdings of RMBS, hence driving down the price and adding to the liquidity spiral. Another reason was the pressure that foreign banks were putting on domestic banks through the correspondent banking system. That pressure showed up in the spread between the Eurodollar rate and the term Fed Funds rate. In the first step, the New York correspondent lends at the Eurodollar rate to the foreign bank, using daylight overdraft at the Fed as its source of funds. It then enters the Fed Funds market to look for reserves needed to meet end of day clearing, and that tends to push up the Fed Funds rate. The Fed, committed to keeping Fed Funds at target, intervenes in the market to provide the funds itself. The spread between Eurodollar and OIS is the incentive for New York correspondents to do this business, so allowing foreign banks indirectly to tap the Fed. The liquidity swap channel took off this pressure by channelling funds instead through official central bank channels.